A file photo of an Embraer aircraft. Brazilian aircraft manufacturer Embraer paid 5.76 million dollar to a shell company in connection with a contract it secured to sell the Indian Air Force (IAF) three aircraft for about 208 million dollar, US Department of Justice said on Tuesday. Such a revelation came as Embraer, as per a Justice Department announcement, entered into a resolution and agreed to pay 205 million dollar to resolve charges of corruption and making bribe payments to foreign nations, including to an agent in India for the IAF deal. 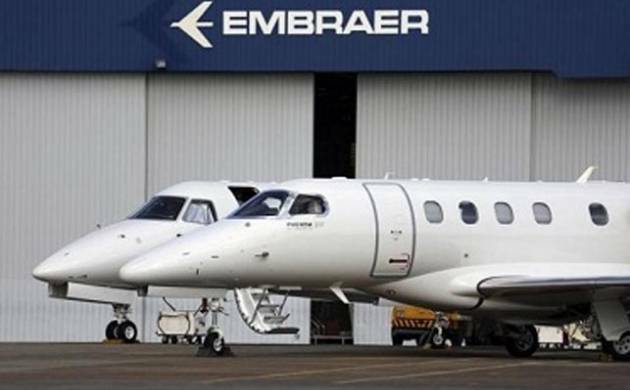 Embraer will pay a penalty of over 107 million dollar in connection with schemes involving bribery of government officials in the Dominican Republic, Saudi Arabia and Mozambique, and millions more over falsely recorded payments in India via a sham agency agreement. In a parallel resolution with the Securities and Exchange Commission and Brazilian authorities, the company will also have to pay 98 million dollar in disgorgement. Embraer earned profits of nearly 84 million dollar on the aircraft sale to India. In 2009, Embraer paid an agent 5.76 million dollar pursuant to a false agency agreement with a shell company in connection with a contract it secured to sell the IAF three aircraft for approximately 208 million dollar, the Justice Department said. "Embraer paid millions of dollars in bribes to win government aircraft contracts in three different continents," said assistant attorney general Leslie R Caldwell. "Embraer tried to bribe their way into several profitable aircraft contracts around the world," said assistant special agent in Charge William J Maddalena. According to court documents, on July 3, 2008, Embraer executed a contract to provide three highly specialised military aircraft to the IAF for nearly 208 million dollar. In connection with the deal, it retained the services of an unknown agent identified in the court as "Agent D" pursuant to a 2005 agency agreement. "It later paid 5.76 million dollar to Agent D pursuant to a false agency agreement signed in or around 2008," federal prosecutors alleged. Federal prosecutors said in January 2005, Embraer executed an agency agreement with a shell company domiciled in the UK and affiliated with Agent D (although the name never appeared in the agreement). Under the agency agreement, Embraer agreed to pay the shell company a commission of 9% of the value of any defence contracts Embraer obtained in India because it believed the agent could help ensure that any contract would be awarded on a single-source, rather than competitive, basis. illegal under Indian law and thus took steps to conceal its existence, including secreting the sole fully-executed version of the agreement in a safe deposit box in London that could be opened only when both an Embraer employee and Agent D or an associate of Agent D were present," federal prosecutors said. Less than a month after executing the agency agreement with the shell company, on February 8, 2005, Embraer announced that it had signed a memorandum of understanding with Defence Research and Development Organisation (DRDO) to support the development of a new early warning radar system for the IAF which Embraer believed could ultimately result in it securing a contract for the sale of three Embraer-145 aircraft. The agreement for purchase of three planes for IAF was signed on July 3, 2008. The very next day, on July 4, 2008, Agent D contacted Embraer employees and demanded payment of the commission pursuant to the contract. "Agent D continued making demands for payment and, in or around February and March, 2009, an Embraer executive met with lawyers representing Agent D to discuss his payment demands. Following these discussions, Embraer executives agreed to pay 5.76 million dollar to Agent D to settle the claim," court papers said. To conceal the payment Embraer created a false agency agreement. On November 21, 2009, more than a year after it was awarded the India contract, Embraer through its wholly-owned subsidiary - ECC Investment Switzerland AG - executed an agency agreement with a shell company domiciled in Singapore and affiliated with Agent D for its purported services as an agent in a sale Embraer had made to an unrelated customer in another country that had purchased an Embraer aircraft more than a year earlier in July, 2008. "The Singaporean shell company never performed any services related to that sale or to the sale to the Indian Air Force," US federal prosecutors alleged. "The same day that the agency agreement was executed, the Singaporean shell company delivered three invoices to ECC, each for 1.92 million dollar. Embraer, through ECC, remitted three payments to the shell company shortly thereafter. Embraer's books and records did not reflect that this transaction was related to its arrangement with Agent D," the Justice Department alleged.